Come by the TDWI Exhibit Hall, where the leading providers of hardware, software, and services for BI, data warehousing, and related technologies will be demonstrating their latest solutions. 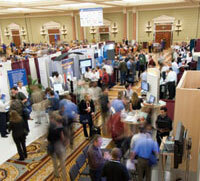 Times will be set aside for visiting with these solution providers without missing any courses. Members of the media are invited to cover the event. Interviews with TDWI analysts and spokespeople are available upon request. Media passes are reserved for press representatives and analysts who can verify that their publication or organization regularly covers data and analytics (including big data, data analytics, Hadoop and other open source data technologies), data warehousing, business intelligence, or related topics. All media are required to provide samples of previous reports covering these topics. Please note: media passes will not be issued to publishers, sales, marketing, advertising, public relations, or technical support staff from any organization. To apply for a media pass, please send an email to bwoodbridge@tdwi.org with the following information: name, title, company, email address, telephone number, dates of attendance, publication/website name (including website URL, link to three articles/blogs/podcasts published in the last three months that cover big data, analytics, or related topics).